eBay has everything a card collector needs, no, wants. However, it has so much more that I don't want, but never did I think there would be a Derek Jeter card on eBay, I wouldn't want to get my hands on. If it's Derek Jeter, I got to have it. Right?! 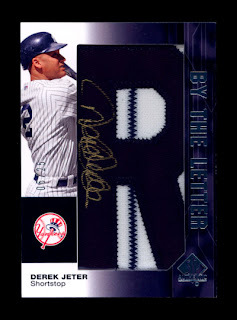 It's a Derek Jeter letter patch card with his autograph. I've seen signatures on messgae boards with every one of these cards and have been jealous everytime. It's a cool card to have ... except now. This is why I don't like the card. For those of you who don't see the issue right away is the fact that Jeter has no letters on the back of his jersey. It's just his number. Again, no letters. Maybe I'm getting a little tired of manufactured items. This year Topps had a boatload of these types of cards with the Legendsd Letteman Patch cards and the Legends Commemorative Patch cards that replicate patches from memorable events. In both instances, the cards were replicas and don't produced to represent the period of time that card came from. In this case, there is nothing to duplicate because there are no letters on the back of Yankee uniforms. I'm not sure why it took me this long to realize this, but that's what happens when I'm left alone for two days. It's hard to tell from the photo but I guess it's a cloth R on the card, like it was cut out of a uniform? Maybe the sewed an R on to a piece of real Jeter uniform? It would still be a cheat. I could be wrong, but I always thought that ALL of these letter cards were manufactured. I thought actual letters from jerseys would be way to big to fit in a card. If that's the case then it isn't just Jeter or the Yankees, it's everyone. But, like I said, I could be wrong. I'm a bit of a moron. It's always safe to assume that all cards like this are manufactured patches unless otherwise noted. Playoff National Treasures football has a rookie set of event used letters, but that's only slightly better. Dang things sell like crazy though. I guess veteran name tapes are just too valuable to put into just a few cards.... Gotta spread them out among many patch cards. it's gotta be tough to be so embarrassed about the onfield product that the players refuse to let people know who they are. I do not get patch cards. I never will. Why? Wha-why? How about the poor fools/idiots that collected "Chamberlain" for Joba? Silly. Of course they are manufactured. That's the whole point of these. People buy them for the autograph. Although it is pretty stupid for the Yanks. They should have made them road grey or something. I actually sold a letter E earlier this year to a guy who eventually bought all the letters to spell out: CHAD BILLINGSLEY LOS ANGELES DODGERS. The E's were short-printed to 15 and he managed to find 4 of them including mine. Pretty cool accomplishment for a player collector in my eyes. These things annoy me to no end. Any knowledgeable baseball fan knows that the Yankees do not have names on any of their regular season uniforms. Not sure about the spring training dark blue jerseys. Halloffamehawk makes a good point, they could have used NEW YORK from the road grays. They are block letters and would be authentic. In regards to the patches in 09 Topps, I actually like them, even though they are manufactured, go figure. I guess I should clarify. i don't like this card with Jeter. I like this type of card with other players, but the Yankee ones bother me. for that matter, so would the Red Sox and Cubs, if they are home unis.